A glass overhead door can give your garage a great modern look. If it’s the time to give a new look to the house, glass is a great option. It adds enormous details to the interiors of the place it is being used or installed. Whether it may be interiors or used in garage. Many people have the habit of adding extra looks to their personal belongings; hence they prefer glass as a better option. Glass door can be installed in many ways indoor as well as outdoor. Outdoor refers to garage, where glass can be used or transformed into many different types of door. There is a very good reason of using glass garage door, they are space saving as they don’t have swinging functionality, adds up to the light of the garage and lastly it adds an increased look and value to your garage. It seamlessly merges interior and the exterior of the house, for the people who are fond of having an area included with their garage. As an alternative they can be used as insulating gates, which stops heat and cold outside. It’s a genuine fact that if a thing has some pros, then it has some cons too. Similarly glass garage doors have some cons. First and the biggest is the cost. Glass garage doors prices are from several hundreds to thousands for a square foot, and then finally it adds thousands to the final bill amount. The cost depends on the feature of the glass panel. The cost touches sky as we forward in the direction of increasing thickness. Insulated glass panel have higher cost as well. Further the installation adds up the cost. So how much do glass doors cost in their respective forms? Answer to this question is as follows. 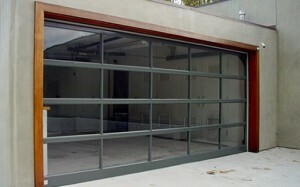 Sectional glass garage door- sectional doors being the most common and widely used doors. The sectional portion consists of panels which slides up and overhead. They cost from 400$ to 1500$. Aluminum frame glass garage door- they cost between 700$ to 1900$. Tempered glass- it basically comes with aluminum casing and is somewhat cheap, costs between 100$ to 210$. There are various other glass garage doors as well but the basic cost is same as depicted above. The cost increases as we move towards the increasing thickness and length of the panel. And additional cost is also applicable which is higher than other door material, i.e. the installation charges. Glass is a delicate material and is to be carried with care. It requires extra attention and equipments to be installed. Commercially glass is used with aluminum frame to make panels. In commercial use different type of glass is used for example tempered glass, anodized glass, insulated, fully black and contemporary glass as well. So it depends on the person whether if he’s willing to merge his living area with garage or if he’s planning to set garage doors. Even glass doors can be used for the exterior purpose as insulated glass although they do not provide 100% air tight surface. Cost of glass doors have been described above and can be preferred accordingly. Before selecting the glass one should consult a professional contractor so as to know which glass material and in which form of gate is to be used.